I hope it’s the beginning of a trend! May I borrow the Bean for some home repairs? Love that picture. 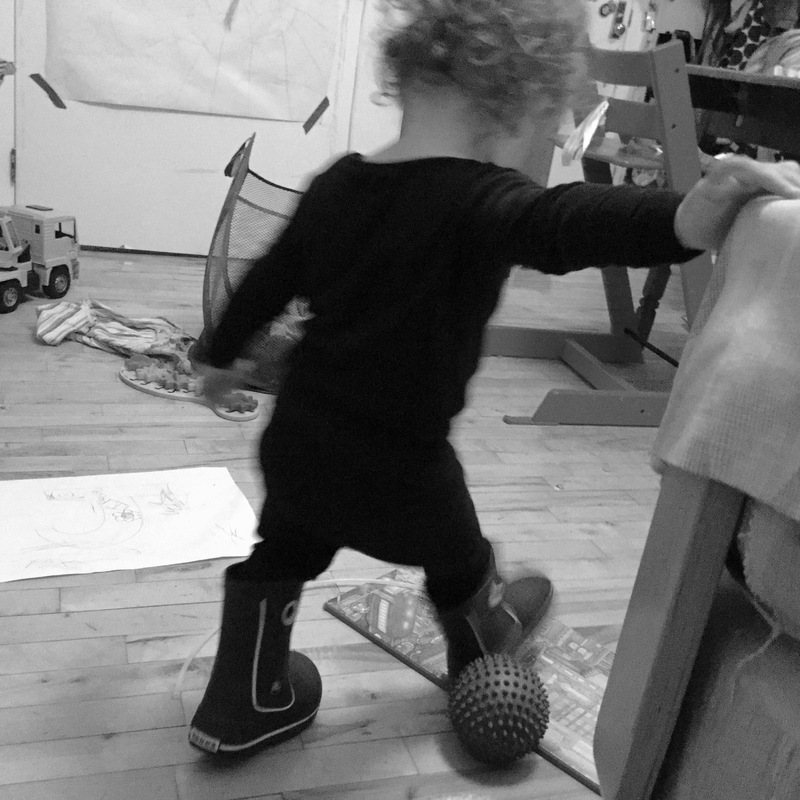 Each of my kids went through a stage where they tromped through the house in their boots. It’s cool that Bean loves his sister so much. I love DINOMITE BLAST! And it’s good to hear that nursing to sleep eventually stops. SB has had sips of water in between sips of milk when her cup was nearby – but that was just regular nursing, not before sleeping. Anyway, they are both totally adorable! Oh man, those kids. Those fabulous kids. Jackalope in a toddler bed already. What the HELL. Wouldn’t it be comical if she just stopped nursing and started putting herself happily to sleep? Have I junked you? We have that same gear turny toy…ours is brightly colored, while it looks like everything in your life is greyscale. Hope you find that therapist–she or he could help with that. I know the target cart of which you speak and have always thought the kids would enjoy it. I haven’t dared to dream that either of mine might be baby crazy, but I suppose it could happen…sounds highly desirable. We only accept toys made of elemental carbon, to avoid nervous excitement in the children’s developing brains. It’s made preschool shopping trickier than I like to say, but when you think of the benefits, it’s hard to imagine how people can Live With Themselves otherwise. I am so jealous of the non-nursing bedtime. Bingo doesn’t nurse overnight anymore (just at bedtime and in the morning) and even that still feels impossibly luxurious. Before you die of jealousy, let the record reflect that this has not happened again, and Jackalope definitely doesn’t go through the night without nursing, perish the thought. The DINOMITE BLAST! story is adorable. I am not glad to know that you are also anxious about school, but am glad to know we are not alone. We’ll get through this. Right now it looks like I can do pick up and drop off because I am still without a job, but that is likely to change. It is so nerve wracking to send them out into the world.